With all of the great fall produce around it seems that I have not had zucchini in a while and I think that I may been having withdrawal symptoms. This recipe for a zucchini and green chili breakfast casserole from Kalyn’s Kitchen has been on my mind since I saw it and I finally had to give in and make it. 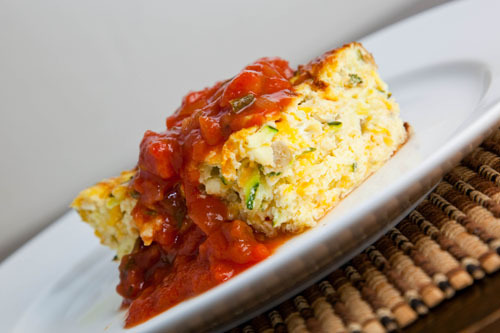 I have made and enjoyed egg breakfast casseroles with jalapenos and baked egg dishes with zucchini in the past, and I liked the sound of combining the zucchini with the spicy green chilies in an egg breakfast casserole. I stuck fairly close to the recipe, though I decided to use grated zucchini as I like the way that it melds in without disturbing the overall texture of the baked egg too much. I also had an almost finished jar of pickled jalapeno peppers that I added for a bit of extra heat. Egg casseroles like this are as easy to make as; mix, pour and bake and they make a lot so you have leftovers for a few really quick and tasty breakfasts during the week. This zucchini and green chili egg casserole turned out as well as I had been anticipating! I served the casserole with some salsa and a dab of sour cream and it made for a breakfast with a kick that really gets you going in the morning! Mix everything in a bowl. Pour the mixture into a greased 8 inch square baking pan. Bake in a preheated 375F/190C oven until the eggs are firmly set and golden brown on top, about 25-35 minutes. So glad you liked it, and I do like your idea of using grated zucchini! I ma so glad tomorrow morning is Saturday so I can make this for a easy late morning breakfast…..
That dish looks really tasty and appetizing! Sounds like a great way to start off the day! Hi Kevin! This is my first time on your blog, and I am mightly impressed. As a fellow Toronto-based blogger, it is great to know what is cookin' around here. I love egg casseroles, by the way, so I am inspired by yours. Might be just the thing for brunch for my huge family gathering this weekend…. Such a different breakfast. It looks perfect! Oh, I think green chiles would really spice up zucchini! How I love zucchini, but it always needs a little something to boost its flavor. You've done it again! ohh I would eat this with a big ole chunk of kimchee. That looks great for lunch right now. Looks good! It would be a super brunch dish- or weekend breakfast when you can take time. Yum! Hmmm, that look really yummy. I want to have breakfast like everyday! It's so funny, so often when I click on a photo on Tastespotting or Foodgawker it leads me back here. Just goes to show I really like what you make, because I am always drawn to the photos without even knowing it's yours. You have a great blog here with amazing recipes. Great job. Kevin… I have guest coming next weekend and this breakfast casserole will be perfect for Saturday morning. Many thanks for posting. What a incredible combination. I am excited to make this for my next brunch! Is it the cottage cheese that makes it look so fluffy? Delicious way to start the day! Looks great! I have this thing for breakfast casseroles, this one looks perfect. At first glance of the pic, I was sure that this was some derivative of corn bread because of the beautiful gold color. I looked at the ingredient list, back at the picture, back at the list….nope. Great job, Kevin. I'm going to give this one a go. Yay for another vegetarian dish. This looks yummy, and I love the use of the zucchini. kanadiyah: I cut this recipe into 6 pieces and had one piece for breakfast each morning for the whole week. You could easily cut the recipe in half by halving all of the ingredients. I would also try to use a smaller baking dish. I would start looking to see if it was set at about the 15 minute marker and it should be done by the 25 minute marker at the latest. This was sooooo delicious and even better the next day! I love this casserole, but am not a cottage cheese fan. Can I omit it? BrownieSugar: You will not really taste the cottage cheese in the casserole but you could replace it with something like cream or even ricotta. Can I make this ahead and refrigerate? Anonymous: Yes this will keep in the fridge for a few days. I like to make it on the weekend and then enjoy it for quick breakfasts during the week. Looking forward to this – it's waiting to be cooked tomorrow morning for our Christmas breakfast. I knew there was a reason those crushed chillies were calling me as I was shopping the other day. Have you ever doubled in a 9 x 13 dish? Vikki Gray: It will work, you will just need to watch the bake time as it may be a bit longer. Hi, this looks great and I would like to make if for a family brunch on Saturday. Angela: The canned green chilies are pretty mild but you can taste test them when you open the can and only add half if you think that would be better for them. Enjoy!